The output signal from the Chopper may be mono or stereo, but is infinitely more interesting in stereo. In stereo, the effect can be panned or "chopped" from one channel to another and combined in phase or out of phase in various ways to produce an infinite number of captivating sounds. Merely describing it will not do it justice. You have to hear it to believe it! In addition to astoundingly new effects, the Chopper will produce stellar versions of traditional effects such as tremolo, auto pan and Leslie (rotating cabinet) effects, but all with a key difference- the frequency of the effects can be varied with the on-board pedal unit. 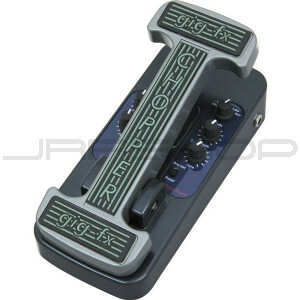 No additional expression pedal is needed. Runs on a 9v battery (included when shipped), or a standard 9v AC adapter. No other pedal can do it all.